Against the backdrop of sports with sweaty strapping players, chess stands apart in its own niche. This silent cerebral war game often has players breaking into a sweat by the very heat of their scheming brains zipping rapidly as they move polished white and black pieces over 64 squares! Soorya G talks to the Inter IIT team about playing chess in and for the institute. 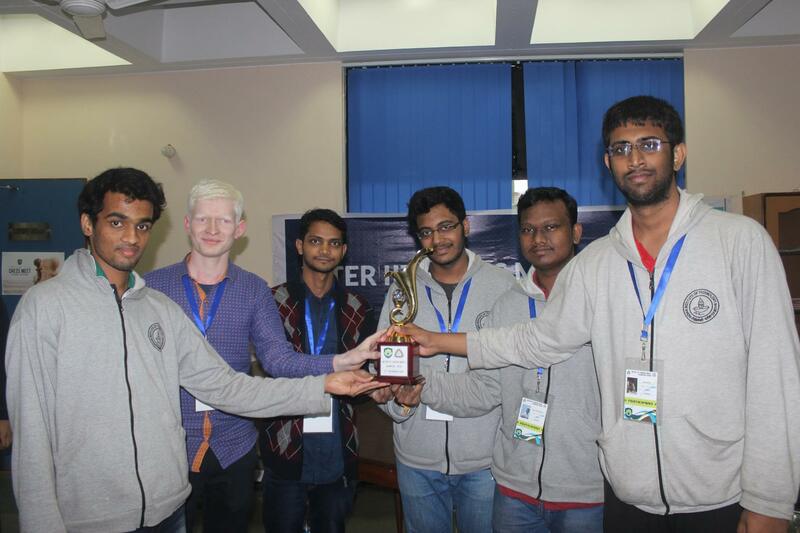 IIT-M chess team bagged the Bronze at the 51st Inter-IIT Sports Meet this year held in Kanpur. With the team’s freshie chessmaster, Shivam Chandak, winning the Best Player of the Tournament Award, let’s take a quick look into our whizzes’ journey and the state of chess as a sport in Insti. “When I was in my first year there wasn’t even a chess club in Insti” says Nitin M Pai, third year undergraduate and current Institute chess team captain. Even as a freshie, Nitin scored 6 over 8 in his debut Inter-IIT, leading the score tally of the team. Every year, Inter-IIT organizing boards dilly-dally about whether to include chess or not. Alleged that it is not even considered a sport event at times, chess’s staid and sober appearance doesn’t get much fan following even among the Inter-IIT organizers across the country. “Actually, chess was tried only as a trial sport at the Inter-IITs from 2009 to 2011 with Bombay winning all of them, but the organizing IITs refused to conduct it in 2012 and 2013 stating that it wasn’t a physical sport”, says Nitin. In stark contrast to IIT Bombay in 2014, IIT Madras’s former sports advisor and the organizing committee were reluctant to have chess even as a side event, when we became the host for the 2015 meet. IIT Bombay has had a bustling chess club for many years, while it is only last year that an informal chess club was formed in IIT Madras through the initiative of chess enthusiasts like Nitin. After being denied support from the Gymkhana, the disappointed students took it on themselves to have the event conducted through the chess club. “We were supported by Dheeresh Chandra (the then General Secretary) and the Dean of Students. A budget of ₹40,000 was passed through the DoST office for conducting it”, said Nitin, expressing his confusion over the objections to playing a world renowned sport. But hard luck struck in the form of the famous floods and eventually spoiled the game in the end. Last year, the chess club took on the task of rigorous team selection three months before the Inter-IITs. Out of two hundred odd applicants, sixty were selected for the next stage from which nine were chosen. A round robin game among the nine decided the final four that went to Kanpur: Shriram, Shivam Chandak, Nitin Pai and Bala Ganapathy. Shriram, the sophomore Mechie of the team, recounts to us their gritty training process. All of them have been exceptional players in their school years and had inevitably taken a break for the JEE preparation. Finely coached in the nuts and bolts of formal chess playing, they now focus on developing their own style in the game. Preparation involves going through their personal database of recorded chess games of the Grandmasters. “If you want to play like Vishy with the white pieces, turn on the database and you’d have 200-odd recorded matches for your reference. But most of them aren’t annotated. That’s when we use books like Bobby Fisher’s 60 Memorable games which he himself comments on.” elaborated Nitin. All of them agree that it’s absolutely important to attend tournaments regularly to maintain form. Members of the team have attended open tournament sprees during the summer vacations. The club led by Nitin participated in the SSN Inter-Collegiate Chess Tournament and the IIT-M Sports Fest, where they put on a great performance against National level team players from other colleges and stood 4th and 2nd respectively. But then, when it comes to ranks and tournaments, the team’s freshie player is several notches above most others. 8-times Gujarat state champion through various age categories, ranked among the top 10 nationally in the under 17 competition, and the champion of the international FIDE rating tournament held recently in Ahmedabad, Shivam Chandak is the star player of the club. Initiated into this ultra-competitive sport at the age of six, Shivam’s winning streak continued till the 11th standard when he took a temporary break for JEE. “First sem was quite cool!” he says excitedly. When asked how the Inter-IITs differed from other national tournaments, he mentions the messy aspects of team chess. In team chess, you have to additionally strategize on who plays whom by the way you choose your boards. In a case of meta-chess strategy, IIT-KGP’s team “sacrificed” their weaker teammate to Shivam and managed to score better than Madras. Shivam also emphasises that Inter-IIT chess event was as tough as any other national event because many national players are currently part of their respective IIT teams.”I don’t quite understand why chess is not given equal importance in Inter-IIT”, remarks Shivam on the current state of affairs. Gymkhana is yet to provide the team with a coach and without a single chess clock, the clubmates share the few personal chess clocks that they have. “It’s not that we are lacking in talent in any way compared to other IITs; IIT Bombay’s club is regularly trained by an International chess-master”, remarks Nitin who has high hopes for freshies like Shivam and Rajas Chari, a Goa state champion. He says, “When chess becomes a part of the main Inter-IIT, all other problems would be solved and we can even expect NSO to initiate chess. You must cultivate what you are already good at, there’s no point in starting all over someplace else”. Bala Ganapthy, the current vice-captain of the team, and who had been a strong member of the team from last year, will be taking over as the captain next year. With very many extraordinarily talented chess whizzes in insti striving to give their best in the game – and acing their game – let’s hope that chess gets its due recognition in the Inter-IITs and the institute community in general.